Beautiful survivors from the first architectural trend of the 20th century still stand tall in Buenos Aires. Get to know the architects of the era, their individual styles, who hired them & what makes local Art Nouveau so unique. Art Nouveau is easy to recognize by its extravagance. Detractors have faulted it as too decorative & too decadent; however, no other Western style has been so varied in its expression. Architects from each European country looked inward for inspiration, then presented their own interpretation of Art Nouveau to the world. Reaching Buenos Aires by way of European-born or -trained architects, the modern city still retains an incredible variety of buildings from this period. With beginnings as diverse as English Arts & Crafts & French Symbolism, this guide provides the background necessary to understand the origins of Art Nouveau. It also explains some of the recurring themes of the style, such as figures of women & the influence of nature. And although Buenos Aires architecture is best described as eclectic, certain patterns & characteristics of local Art Nouveau are identified & discussed. Unfamiliar with Argentine architects? Not a problem. Given that local practitioners have yet to find fame like Catalunya’s Antoni Gaudí or Belgium’s Victor Horta, the guide includes biographies of four of the most important: Virginio Colombo, Francisco Gianotti, Julián García Núñez, & Alfred Massüe. Their personal histories had an enormous influence on each indiudual’s interpretation of Art Nouveau. In fact, these architects were so important locally that their combined works account for almost one-third of the listings in the guide. 75 buildings & monuments may seem like a large number to list, but many are grouped throughout the city in centrally located areas. No need to cover all 200 square kilometers of Buenos Aires! We’ve also narrowed the field by highlighting 23 icons of the city. Each iconic building is accompanied by text to explain its importance… definitely make these a priority. Also keep in mind that 11 of the 75 listings can be found within the walls of Recoleta Cemetery, a must-see for any visitor. Each listing includes the name & type of building or artwork, its exact address plus the architect or sculptor & year designed (if known). Over 10 detailed maps help keep you on track. Covering areas of the city often visited by tourists, the maps also allow you to break away & connect your own dots. Keep this guide handy while exploring the city & incorporate a bit of Art Nouveau while visiting other sights. Like wonderful architecture? Enjoy walking through a city & finding surprises? This PDF guide helps visitors explore a side of Buenos Aires yet to be discovered by many… including locals. 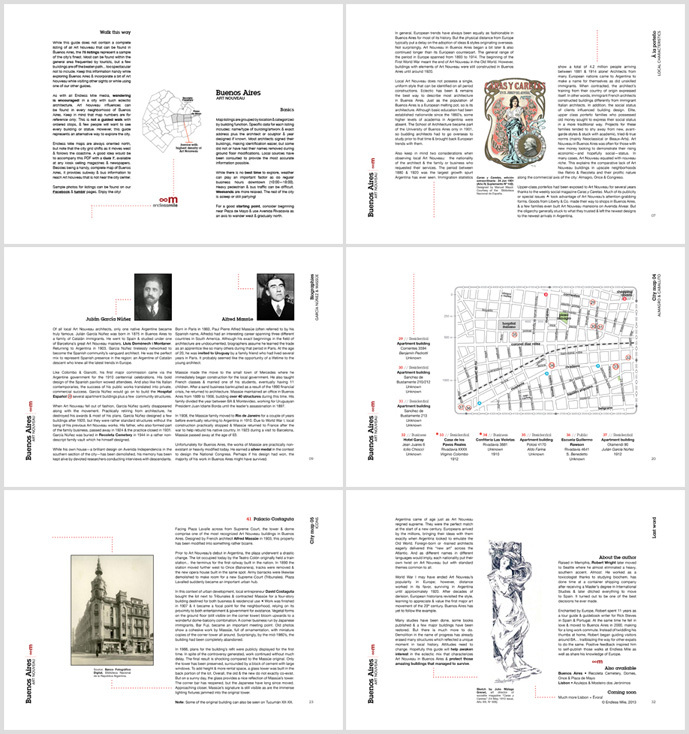 Format: PDF, A4 landscape, 33 pages. Ideal for viewing on any tablet or for print. Released Feb 2013. This guide may not be redistributed, resold or reprinted. Duration: Spend as much time as you like. This is not a guided walk with ordered stops, & few people will want to see every listing. However, the Art Nouveau guide represents a unique way to explore the city.